Image Comparer is extremely useful to professional photographers, designers, and webmasters, who have “image-heavy” sites to maintain. The program is incredibly fast; after a minute or two one can see how many duplicate images are stored and how much disk space will be saved by removing the duplicates. The “dupes” can then be removed all at once with one click. 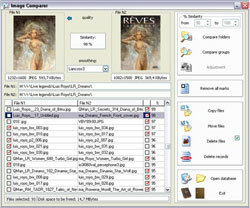 Alternatively, a user can specify which images need to be deleted, moved or copied. The list of supported image file formats includes JPEG, J2K, BMP, GIF, PCX, PNG, TIFF, TGA, ICO, and CUR.